Lying back on grass looking up what used to be a hideous raised highway. Enjoying blue skies. 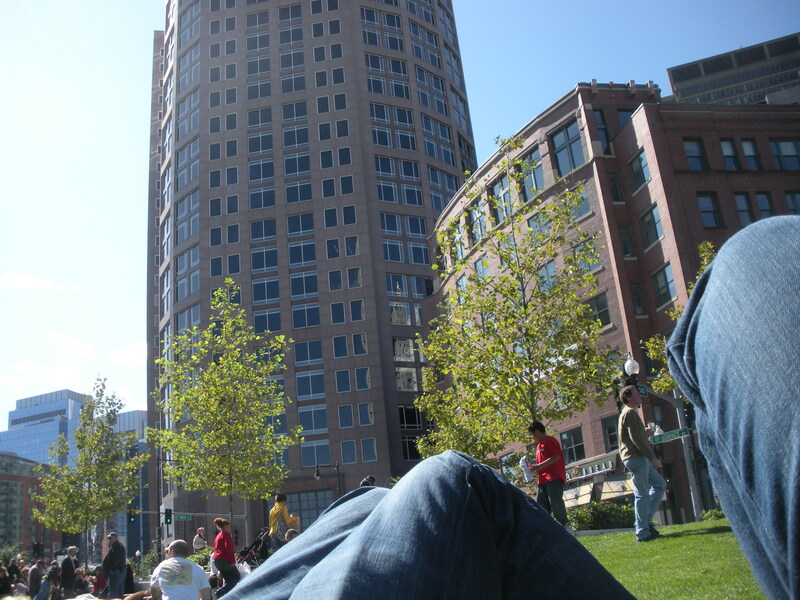 The dedication and debut of the Rose Kennedy Greenway took place under sunny skies. Throngs of Bostonians came out for the celebration that really put our best face forward. City kids from Charlestown represented (with a “my kind of town”), dance groups smoking hot or sultry, krunk to gospel, to breakdancing, even ballet. The Dewey Sq market was bittersweet. Okay, it was sweet, I was bitter. I mean it’s kind of false showing off for the visitors “our farmer’s market” when they took it away from us! Then there was the “green” vendors giving away books on fast food – hello? And the Globe passing out “Green” supplements. Um, paper = opposite of green. Still, it was a day full of smiles and joy. Kids rolling down grassy hills, playing with art installations, fountains. A calliope, a ferris wheel. There were free food vendors (Olivia’s organic salads) and water stations everywhere. Even the Hard Rock got in the act, being a good neighbor and giving away pulled pork sammies. The plans for the new museum and cultural centers are beautiful. Volunteers were pleased to tell visitors all about the designs and the art that is coming. Finding someone who could articulate accurately the permanent public market plans, however, that was quite another story. That elusive “carrot” was promised for our concessions, our willingness to live in the contruction zone all these years. I could bury the new museum with all the construction dust that came in through windows, even closed ones. Almost no one can tell us now what’s happened to the public market plans. Not even one measly little flyer at any of the Conservancy booths. Not one talking point on the greenway flyers. Not one architect’s rendering of that promised market. Shows how important it is in the plans. But the positive aspects of a public market were on display for all to see in that mirage of the Dewey Square market: farmers and artisans meeting face-to-face with city residents. Visitors sampling organic foods, buying local apples. Tourists picnicking on the greenway lawns. I hope that people will see how a public space, like a permanent market such as Seattle has, such as Toronto has, Cleveland, even Philly, creates a gathering place for the city and her visitors, a venue for our local farmers and artists. The market, if we ever see it happen, will be a gem in Boston’s green crown and the fulfillment of a promise that seems hard to track. Like flickering lights from the Illuminale displays, it seems so close, we just can’t grab hold. See the Greenway Conservancy site here at RoseKennedyGreenway.org.